Proper eyelid treatment is key to maintaining the overall health of your eyes. That includes using the right swollen eyelid treatment regimens and addressing itchy or dry eyes right away. After all, your eyelids play an important role. The eyelid is the thin layer of skin which covers your eye. Essentially, this is the only form of natural protection your eye has to the outside world. The eye itself contains a muscle which is able to retract the eyelid in order to open and close. This may be done by both voluntary and involuntary movement. Go ahead, think about it and you can blink your eye at your command. Alternatively, this muscle also blinks involuntarily without you knowing or even trying. Various studies have concluded that an average person may blink 15 to 20 times per minute! Again, the main function of the eyelid is to protect the eye from things in the outside world which may cause damage but, it also serves other purposes. Another purpose is that the eyelid spreads regular tears on the eye’s surface which keeps it moist. Every time you blink the eyelid is spreading a small amount of tears on the eye. To fully understand the importance of the eyelids its worthwhile to have a brief understanding of how the eyelids actually work. Each eyelid contains a variety of glands, such as the sebaceous glands, sweat glands, tear glands, and the Meibomian glands. 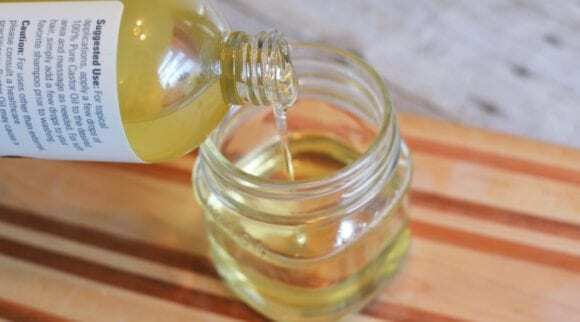 It is the tear gland which, as mentioned in the previous paragraph, provide for the lubrication and moisture our eyes need on a continuous basis. The lacrimal gland actually secretes tears. Additionally, the lacrimal gland is what produces tears for when a person cries whether it be out of emotional or physical pain. Finally, the lacrimal gland is also responsible for the tears which are produced when you get something in your eye and it becomes wet attempting to “wash out” the foreign body. The eyelids also contain various muscles which are essential to their function. Three of the primary muscles are the levator, muller, and frontalis. Beyond those primary three there are others such as the orbicularis oculi, which goes around the entire eye. These are the muscles which serve the purpose of closing the eye when protection is needed. When there is something headed towards you and you shut your eye in a hurry it is because of these muscles. Another important function of the orbicularis oculi muscle group is they assist in forming the various facial expressions human are capable of producing. What are common problems which affect the eyelids? 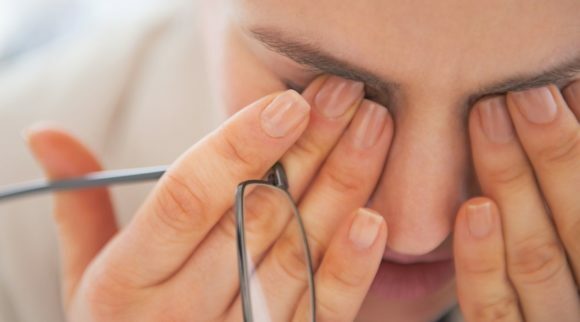 While there are a multitude of problems and issues which may impact eyelids, the list below provides some of the more common problems which people experience. Dermatochalisis- this is due to an extra eyelid skin which develops. Typically, this only occurs in persons who are 50 years of age or older. Unfortunately, this condition often develops as a normal part of the aging process in a lot of people. This condition is caused by fat moving forward and the eyelid tissue losing its tone due to the natural aging process. The outcome of this condition is that if it becomes severe enough that it may actually block the upper visual field leading to decreased vision and overall awareness. Persons whose vision has been negatively impacted by this condition may be recommended by their optometrist to undergo a blepharoplasty which will remove the excessive tissue and, in most cases, result in full vision restoration. Entropion- this is the result of the lower lid margin turning inward towards the surface of the eye. This will lead to your eyelashes actually frequently rubbing against your cornea and conjunctiva. Both of these actions will cause discomfort in an affected individual such irritation, the sensation of something always being in your eye, infections, and scarring and ulceration of the cornea. As with the previous condition covered, this is attributed to the natural aging process in which the eyelid muscles lose their tone and the eyelid skin is no longer able to provide the needed protection and serve its natural purpose. Entropion is more than likely able to be corrected with surgery to fix the issue of the loose eyelid skin. Ectropion- this condition is where the eyelid will actually fold, turn outward, or just sag lower than normal. This is a dangerous condition as the eye itself become exposed to the elements and dries out. 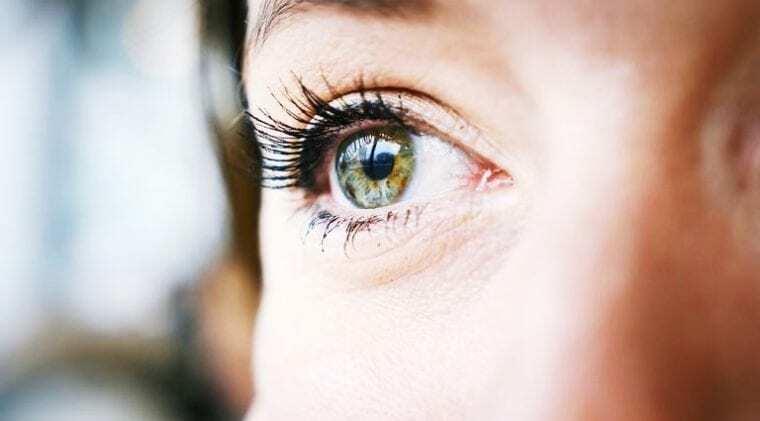 Symptoms of this condition are more severe as the person affected likely will have a mucus discharge, a feeling of sandiness or grittiness in their eye, irritation, and cornea scarring. 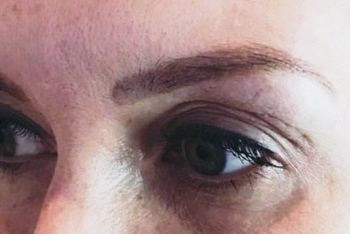 Again, this condition is attributed to the natural aging process as the eyelid muscles lose their tone and are not able to perform their natural movements anymore. Persons should be alarmed when they or other people start to notice that they can see more “red or pink” under their eye. Myokymia- this is a condition which the eyelid twitches. This condition is not dependent upon age as a person of any age may end up with this condition. Myokymia occurs when the skin of the eyelid moves involuntarily. This can actually be felt and seen by the person affected. Common causes which bring upon Myokymia are fatigue, stress, anxiety, too much caffeine, or too much screen time. There is no surgery associated with fixing this condition; rather, good old-fashioned rest and relaxation is all that is needed. If you’re experiencing these symptoms step back and take a look at what’s going on in your life. Look at the factors just mentioned and see if you are guilty of one or more. If so, take appropriate measures to eliminate or at minimum reduce them. Blepharospasm- this condition is an abnormal and forceful contraction of the eyelid muscles. A person will likely experience very mild symptoms at first but then notice over time that they become more forceful and noticeable. Unfortunately, evidence has yet to be discovered which causes this condition or any linkages to any other diseases. Persons with this condition are recommended to have Botox injections which prevent muscles from contracting. Yes, Botox actually has a number of medical uses; it’s not just for temporarily smoothing out wrinkles. A fun fact is that Botox may actually be injected to a person’s underarms to stop excessive sweating! Bell’s Palsy- this condition is a paralysis or severe weakness of muscles and nerves on a side of your face. This comes upon without prior warning and will typically heal itself within a few weeks; however, in severe cases it may last up to a few months. This condition is typically associated with persons who carry the herpes virus or by a person going through an extreme amount of stress. Sadly, a lot of people who have experienced this condition actually thought they were having a stroke because it was so severe. Having swollen eyelids is one of the easiest ways to tell that your eyelids are not in optimum health and corrective action needs to be taken. A swollen eyelid occurs when there is either inflammation or excess fluid in the tissues surrounding the eye. A person with swollen eyelids may or may not experience pain. Both the upper and lower eyelids are subject to these conditions; or even at the same time. Irritation such as having an itchy or scratchy sensation around the eyes. You have become sensitive to light which never bothered you before. Experiencing an abnormal amount of tear production resulting in excessive watering of the eyes. Vision which has become obstructed and unclear with no sign of injury. Eyelids have become red, dry, or even flaking. Extreme pain, especially when the eyelids have become swollen due to an infection. Allergies: This occurs when a person’s immune system experiences an overreaction to a substance which is not naturally found in the body. Examples of allergens include but are not limited to pollen, dust, pet dander, and even eye drops or contact lens solutions. 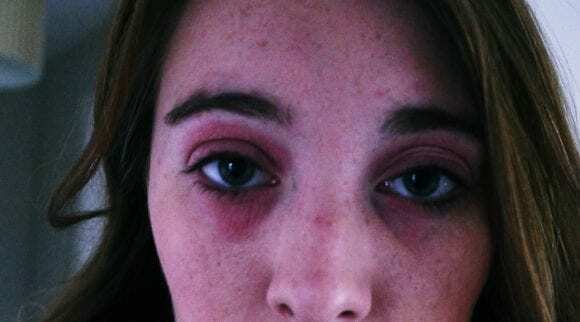 The aforementioned variables have been classified as the most common reasons a person may experience swollen eyelids due to an allergic reaction. When a substance has entered your eyes which you are allergic to, your eyes will release chemicals to protect the eyes to shield them from the allergens. The most commonly known form of these chemical is histamine. Histamine causes the blood vessels in the eyes to dilate, leading to swelling, irritation, and itching. Conjunctivitis: Also known as “pink eye” to parents who dread the day when their kid brings this home from school. This is a condition in which there is an inflammation of the clear lining of the eye’s surface. There are various forms of this condition which may be bacterial or viral; both of which can lead to swollen eyelids. 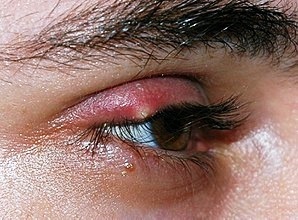 A person with this condition will have very red or pink eyes which will be both watery and extremely itchy. What’s scarier about this condition is how contagious it is and can spread very quickly at social gatherings, particularly schools with younger children. Also, it’s important to receive medical advice to determine if the condition has been caused by a virus or bacteria as the treatment option to address the problem will depend on such. Styes: These appear as a red, swollen bump on the edge of the eyelid. Styes are usually causes by a bacterial infection and inflammation of the Meibomian gland. The Meibomian gland produces oil and when it gets blocked it results in a stye. Styes are not pimples or zits as some people may think and they should not be treated as such. Again, and it’s important to repeat this, styes are not pimples or zits and should not be treated as such. 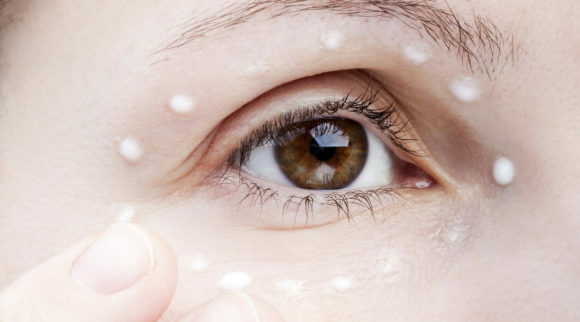 Trying to “pop” a stye or put acne medication on the eye will result in more damaging effects. A severe stye can actually cause the entire eyelid to shut completely. Styes are often extremely tender. Trauma injury: Taking a baseball to the eye will also result in swollen eyelids. Any form of blunt trauma to the eye area may result in swelling or bruising; or as it’s often referred to as a “black eye.” Only time will heal a black eye, but certain medications may be taken to alleviate pain and other measures can be taken to reduce swelling. As with any medical condition, there are recommendations by medical professionals which serve as preventative measures to decrease the likelihood of the condition occurring. However, sometimes things just happen regardless of how careful you are and people must understand that there is no full-proof method. It’s a recommended and common practice to get tested for allergies at an early age to identify potential allergens. Many parents request allergen tests for their children when they are very young in order to minimize their exposure to certain things. Most people think of food allergens, but others can impact breathing and sight. For example, some people are allergic to cat dander and when they go to a house which has cats then their eyelids start to swell as a result. Some people may be aware of what will set off their allergic reactions and will take preventative measures such as taking medication prior to being exposed but it may provide minimal or no protection at all for some. If you wear make-up or other beauty products which will be put on your face or around your eyes it’s imperative to purchase those which are both hypoallergenic and fragrance-free. Products which follow these guidelines significantly reduce the probability of an allergic reaction leading to swollen eyelids. While this recommendation may not work for everyone, some people have noted that when they are searching for make-up or other beauty products they will swab a test sample on the wrist to see if it turns red or any other symptoms arise. If you have dry eyes or need eye drops for another purpose you should seek out eye drops which are preservative-free. 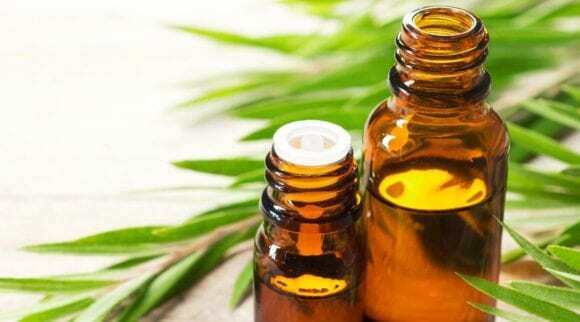 It’s true that eye drops which do have preservatives inhibit bacterial growth, it’s also true that people are more subject to having an allergic reaction to eye drops which have preservatives. If a person is already using eye drops for one reason to treat their eyes they don’t need to be subject to an allergic reaction swelling their eyelids as then they would have to address two separate problems. Make sure that you use proper hygiene to care for your contact lenses. Improper care can lead to bacterial infections and other inflammatory issues resulting in eyelid swelling. Frequently replace your contact lenses and solution as recommended by both your optometrist and instructions of your contact lens’ care products. Eyelid eczema is a condition where areas around the eyes become inflamed, itchy, red, cracked, and rough. In some cases, blisters may also be present causing a significant amount more pain to the person. It is estimated that nearly 30% of people in the United States are impacted by some form of eczema, whether it be their eyes or other part(s) of their body. The term “eczema” is specifically used to address atopic dermatitis, which is the most common form of eczema. “Atopic” is a collection of a variety of diseases which involve the immune system. Dermatitis is an inflammation of the skin. While some people may see fewer and fewer flare-ups or eventually never experience any again, others may continue to experience systems the rest of their lives. There is no test or correlation to determine those who will be lucky enough to grow out of it and those who will not. As with any medical condition, some persons may experience one or many of the symptoms below at differing severity levels. No two person’s genetic and environmental factors are the same. The condition does occur in infants as will be noticed with dry and scaly patches appearing around their eyes. Most people who will have eczema will develop it before the age of five. Unfortunately, for those who do have eczema before age of five more than half of them will still continue to experience symptoms and flare-ups into adulthood. Rashes will likely appear on scalp or cheeks but may be elsewhere, including the eyes. The rashes will “bubble up” before fluid will start leaking from them. Be prepared for sleepless nights as these rashes are very itchy which will interrupt the infant’s sleep patterns. The infant’s continuous rubbing and scratching may lead to infections, so it’s advised to watch for that. The rashes now usually appear behind elbows or knees. Other areas rashes may occur are the neck, wrists, ankles, and the crease of the buttocks and legs. Rashes may become bumpy and could lighten or darken in color. 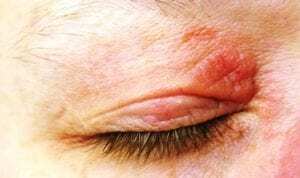 Adulthood is when eczema is most likely to occur on the eyelids; however, infants and children may still develop eczema on the eyelids but it’s not as common. The rash covers the majority of the body and can cause extremely dry skin. In some cases, the rashes may turn into permanent itches. Adult eczema rashes are more scaly than those found in infants and children. Unlike some conditions, there is not a cure for eczema. The only available options are to treat conditions when they flare up and try to prevent future flare-ups from occurring. The best advice is to speak with your doctor to develop a course of action and treatment plan which will most likely be centered around your age, symptoms, and current health. Apply a moisturizer immediately after a bath or shower to keep moisture in. This should be done every day if possible. Avoid rough and scratchy clothing. Also, tight-fitting clothing is not recommended as it may also irritate the skin. Use a mild soap when washing your body. Air dry or very gently pat your skin with a towel after bathing instead of rubbing. Exercise is always recommended for physical health but beware that activities which quickly raise your body temperature and make you sweat also increase probability of a flare-up. Keep your fingernails short which will minimize impact of any uncontrollable scratching. An allergic reaction to something, such as cosmetics, pollen, metals, or other things which may be considered an allergen. The eyelid may have come into contact with a substance which has damaged the outer layer of the skin such as make-up, detergents, or soaps. For you own reference, they do make soaps and laundry detergents which decrease likelihood of this happening not only for babies but adults too. The industry just does a better job at marketing products to newborn parents who are worried about their baby’s skin. Microbes such as certain bacteria, viruses, and fungi. Extreme hot or cold temperatures as well as high or low humidity. The type of food a person eats. Correlation of having flare-ups are associated with dairy products, eggs, nuts and seeds, soy products, and wheat. While stress is not directly related to cause a flare-up, it can significantly worsen the symptoms someone is experiencing. Women are also subject to having flare-ups due to their fluctuating hormones. They are more likely to experience a flare-up when they are pregnant or at certain points in their menstrual cycle. If you’re looking for swollen eyelid treatment or itchy eyelid treatment, then this should be your go-to product. Heyedrate’s Lid and Lash Cleanser is perfect to address a multitude of swollen and itchy eye conditions caused by styes, blepharitis, dry eyes, or Meibomian gland dysfunction. The product fights bacteria on the eyelids and other areas around the eye area. The product is 100% organic, vegan, and designed to provide relief the all-natural way. There are no alcohols, fragrances, parabens, sulfates, or preservatives. The formula is also hypoallergenic to decrease likelihood of additional flare-ups. To use, simply clean the eyelids of any debris or make-up and spray your closed eyelids with one or two sprays of the product. Then, gently rub it into the lower and upper lid and lash margin. It’s recommended to use this product both in the mornings and evenings before bed. 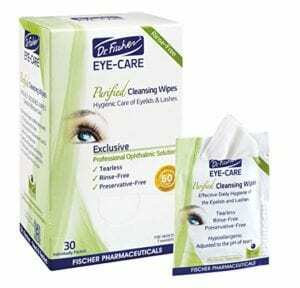 This is a perfect product for persons who need swollen eyelid treatment fast due to aggravated allergies. The product is designed to temporarily relieve itchy, red eyes caused by pollen, ragweed, grass, animal hair or dander. What’s even better about these pads is that they already are pre-moistened, so you can easily keep them in your purse, wallet, or vehicle. The pads are effective at removing oil, debris, and desquamated skin from eyelids. The product utilizes a low-level preservative for providing an array of different anti-bacterial activity. 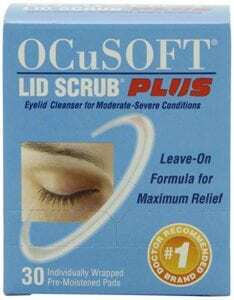 It is recommended for persons who have moderate to severe eyelid conditions. If your symptoms range from mild to medium then it is recommended to instead use OCuSoft’s Lid Scrub Original as it has a milder formula than the plus version. Both products are designed for the same purpose and use with the primary difference being the level of the condition needing treatment. This is an excellent product for eyelid eczema treatment as it will provide the relief people are seeking from the condition. The product has been developed for treatment for a variety of conditions that may cause swollen eyelids, including blepharitis. 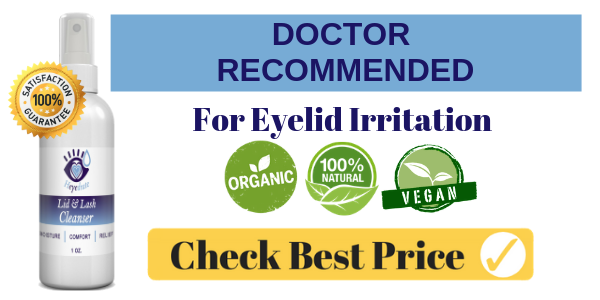 Additionally, if you are suffering from other forms of itchy eyelids, have the sensation that something is in your eye, or you have bumps or styes, then this is a fast-acting product designed to give you immediate relief. The developer of this product has made it vegan, cruelty-free, gluten-free, paraben/formaldehyde free, and free of other well-known chemicals which many beauty and pain relief products contain; including absolutely no preservatives. To use this product, simply wash your hands and remove contact lenses (if applicable), place two drops on a cotton swab, and carefully scrub the base of the lashes. Make sure to repeat this procedure on all eyelids and use on a nightly basis. A natural dermatitis treatment is hard to find but Dr. Fischer’s Premium, Purified Cleansing Wipes are ideal for such a condition. The wipes provide a gentle and effective solution which is free of preservatives, alcohol, and other common irritants. It is also perfect if you get something in your eye, since if you simply rub your eyes with your hands or fingers you are risking further complications such as additional bacteria and/or scrapes or tears leading to a potential infection. This product is 100% safe for persons of all age groups. One of the primary conditions the product targets to provide relief to is Conjunctivitis, or “pink eye.” Children acquire this condition from their peers at school or other events. This product is perfect for parents to use to provide relief to their children’s pain. In addition to being used for swollen eyelid treatment it is also great just to alleviate eye fatigue which is often associated with excessive amounts of time spent viewing technology. 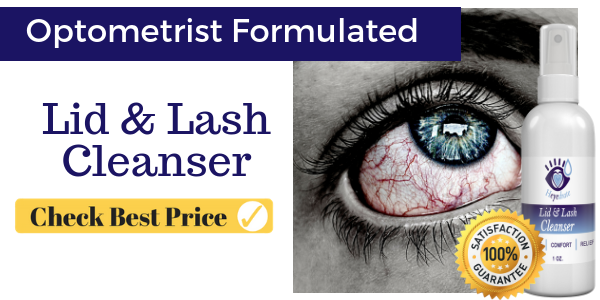 This product is perfect for swollen eyelid treatment fast as well as to alleviate symptoms of eyelid dermatitis as it’s a moisturizer with clinically proved ingredients to naturally heal areas including the face, eyelids, and neck. The natural healing ingredient contained in this product is raw honey. Raw honey is an antibiotic and moisturizer for your skin, so you are receiving double the benefits in just one product! 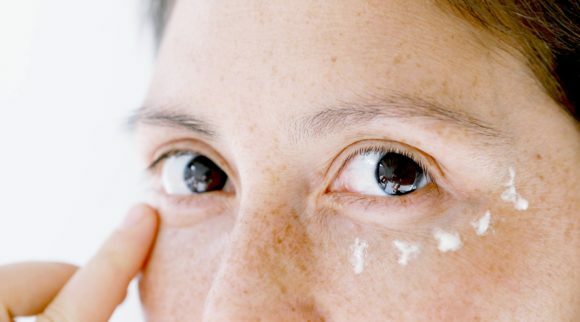 Use the cream by gently applying it to your eyelids or other areas which may be damaged or simply need moisturizing by using small, circular motions. Only small amounts are needed and if you over apply the cream it may take longer to absorb. The product will leave your skin feeling ultra-hydrated. The beeswax contained in the product improves elasticity, softness, and suppleness of your skin. What’s even better is that it is directly absorbed by your skin and will not clog any pores. In today’s world, more and more men are realizing the benefits of health care and beauty products to look their best at all times. Unfortunately, a man with eyelid dermatitis or swollen eyelids will never look their best. The good news is that companies are now formulating products with a man’s skin in mind. 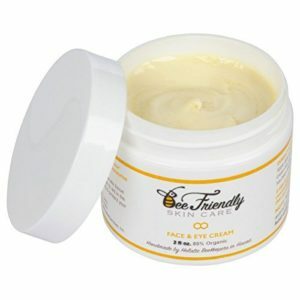 This product reduces puffiness, wrinkles, bags, and dark circles around the eyes. 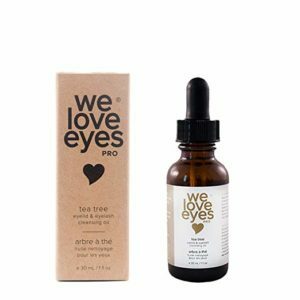 If you have had an allergic reaction which has led to swollen eyes, then use this product to not only take down the puffiness but also hydrate the skin around your eyes leaving it looking brighter and more energized. The cream is fast-absorbing, lightweight, and immediately sinks into your skin without leaving any residue or shine. 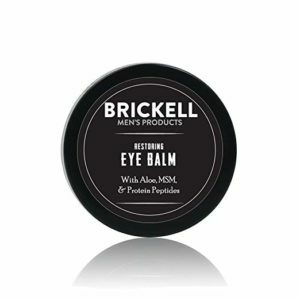 We hope this roundup of helpful products to help you get relief from dry, swollen, or itchy eyes has been helpful. If your symptoms persist or you’re not sure what’s causing them, be sure to pay a visit to your doctor to learn about the most effective treatment.